IMAGE: This is an underwater photo of gravel bottom of Yellowstone Lake and varved sediment core. A new study shows that the increase in human activities and nutrient release have led to the current rise in the number of hypoxic lakes worldwide. This finding has just been released in the journal Global Change Biology. The international research team has found out that the onset of lacustrine hypoxia is mainly due to direct and local anthropogenic impacts rather than to recent climate change. The study also showed that aquatic rehabilitation programs have failed so far to return lake bottoms to their original well-oxygenated status. Dissolved oxygen is fundamental to the health of lakes and streams, and the recent oxygen depletion of bottom waters (hypoxia) is a major threat to freshwater resources. Both eutrophication (caused by an excess of nutrients) and climate change can deplete bottom-water oxygen. But it is difficult to identify the main forcing factor between these two since they have confounding effects. Moreover, hypoxia can also have a natural origin. Continuous long-term monitoring of lake-water oxygenation would be required to clearly determine the cause of hypoxia, but these records are rarely available. 'Because long-term monitoring data are scarce or missing and almost never cover the pre-industrial period, long-term trends of historical changes in lake hypoxia have to be reconstructed from analysis of well-dated sediments' explains one of the co-author, Jean-Philippe Jenny of the National Institute of Scientific Research (INRS). The structure of the sediments of many lakes offers a simple proxy for the oxygenation history of bottom waters. When laminated sediment appears on top of homogeneous sediment, it indicates that oxygenation conditions have fallen below a critical threshold. 'Varves are annual sediment laminations which have the additional advantage that the shift from well-oxygenated to at least seasonal hypoxic conditions can often be precisely dated' says co-author Pierre Francus, Professor at the INRS. The researchers have compiled the onset and duration of hypoxia since AD 1700 recorded in varved or laminated sediments for 365 lakes worldwide. The lakes are located in a variety of climates, biomes, and degrees of human impact. The analysis showed that 71 of these lakes (~20%) have shifted to hypoxic conditions since the middle of the 19th century. These hypoxic lakes are in general located in areas with higher human population density and more nutrient emissions (related to a greater coverage of urban and cultivated areas) than naturally hypoxic sites (those with hypoxia going back more than 300 years). No correlations were found with changes in precipitation or temperature. 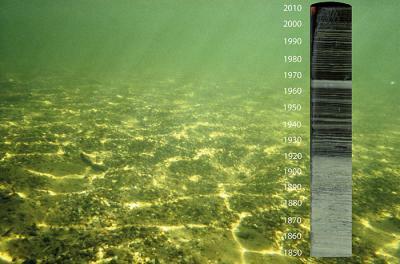 Also, even though aquatic rehabilitation programs established since the 1980s in European and North-American countries have succeeded in reducing the influx of nutrients to lakes and subsequent eutrophication, the persistence of hypoxia over the last decades in lakes indicates a weak resilience of freshwater ecosystems which could be worsened by current climate warming. Source: Jenny, J.P., P. Francus, A. Normandeau, F. Lapointe, M-E. Perga, A.E.K. Ojala, A. Schimmelmann, B. Zolitschka, 2015. Global spread of hypoxia in freshwater ecosystems during the last three centuries is caused by rising local human pressure. Global Change Biology, Online.